With the coming of 2017, I can really feel a very special atmosphere. This year we will see many promises come to pass, especially those, which were given to us long time ago. There are people, whom God has given a big promise to, like once He has given such to Abraham. That vision required an appointed time. I am having a clear understanding, that in 2017 many sons will become fathers, and the time that many have been waiting for, has now come. The Lord has given me this phrase, “I`ve given you the promise, now I am setting the time for it.” Take courage and don`t get weary; don`t look at attacks and don`t expect them on your way. Don`t be looking at people as your enemies, neither await troubles to come through them. Now it is time to see that everything, literally everything, works for your good and guarantees that your promises are going to come to pass. This is the time to walk by faith and release faith. Faith is coming from the Father. I really liked the quote about it by John G. Lake, “The reason people do not have a rich, beautiful faith is that their spirit is denied the privilege of communion and fellowship with the Father”. May everybody finds joy in fellowship with our Heavenly Father and gets stronger in faith. 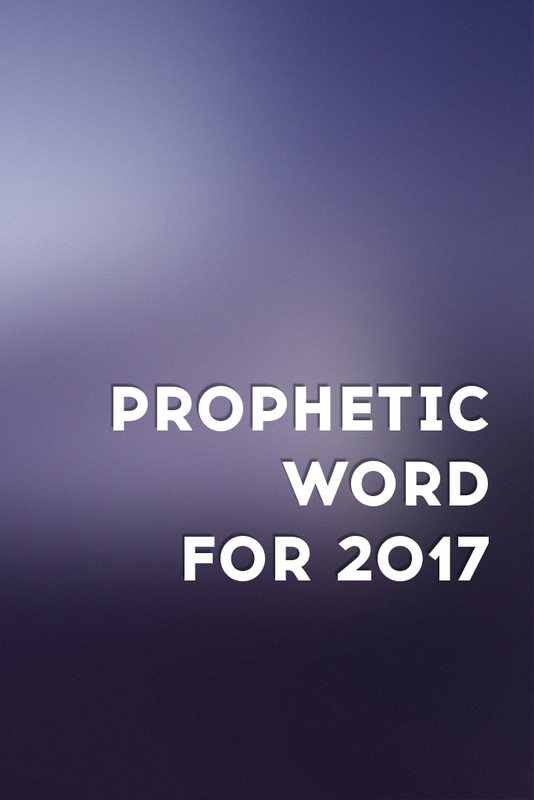 This year is also a year to restoration; it is the time of Zechariah chapter 4. Many have already started to walk in their destiny, but faced huge skepticism from people around, attacks, which brought confusion, chaos and division. But the Lord is saying that His promises will go before you, and it is the time for the restoration. Zerubbabel was a leader of Judea, who restored the building of the temple, based on the foundation that had previously been laid. God said to Zechariah, that the mountains before Zerubbabel would become level ground. Here it also says that the restoration will come through the outpouring of the Holy Spirit. Zerubbabel was the one to start and also complete the house of God. The Lord is greatly contributing to the process of restoration and is rejoicing over it. This is the word of the Lord unto Zerubbabel, saying, Not by might, nor by power, but by my spirit, saith the Lord of hosts. Who art thou, O great mountain? before Zerubbabel thou shalt become a plain: and he shall bring forth the headstone thereof with shoutings, crying, Grace, grace unto it. Moreover the word of the Lord came unto me, saying, The hands of Zerubbabel have laid the foundation of this house; his hands shall also finish it; and thou shalt know that the Lord of hosts hath sent me unto you. For who hath despised the day of small things? for they shall rejoice, and shall see the plummet in the hand of Zerubbabel with those seven; they are the eyes of the Lord, which run to and fro through the whole earth. The Lord is restoring throughout the whole world. Don`t be afraid – only believe! This is the time of joy and great miracles! This is what God was telling me about 2017! I feel how the season of spring is coming! Several times before the New Year’s Day and first days after it God was showing me the period of spring beginning. There were a lot of frozen and ice-covered things. Winter was a really long period, and I began to see how the season of Spring came. Everything starts to melt, and lot of dirt comes up, a lot of garbage is seen, stuff that was frozen for a long time. But also, flowers, trees start to turn green. Beauty and nature wake up together with the period of thaw. I feel how the season of Spring comes into the relationship sphere in a special way. It is healing. And the Body of Christ needs to live through a kind of creepy period of thaw. Spiritual and physical families, we all have to feel the coming warmth of Spring and not to be afraid of the dirt that is coming to the end. It is just a shift of seasons!